This is a simple mini golf, only with FANTASTIC graphics and environment. You'll find such things as cows, toads, ski slopes, torpedoes, aliens and many other things on your mission to push a little ball around eighteen holes in pursuit of the lowest score. Use Mouse to aim, set power and putt the ball. Angry bulls, brave matadors, hot sun, wine and passionate black-haired girls. That is, perhaps, all that occurs to somebody when he hears the word "Spain". But we have decided to break the trend and add yet another assosiation to the previous ones - games. It may seem quite odd but we haven't made any mistake. In the nearest future a team of our developers would be pleased to offer you a set of games based on Spanish motives. Generally, Spanish games like Chinese, Japanese, German ones belong to the category of national games. A rich history of this country full of battles, knights, and discoveries valuable to the entire world makes a perfect basis for various actions, strategies, shooters and the like. Just imagine a computer game based on widely known voyages of Christopher Columbus and his discovery of the American continent! What a fine adventure game can the gamers enjoy! Or an exellent war game inspired by the bloody battles between the Arabs and the Spaniards during the Middle Ages... Vast territories, powerful castles, proud kings and queens and their people fighting against ferocious invaders... Well, there is a lot of fine motives and ideas and a lot of hard work to do at the same time. It requires some time to see the first results and assess the comments of the gamers. But we are strictly imposed to do our best to meet the needs of the visitors of our web site. So await new interesting Spanish games soon. So far we have got a pleasure to offer you only one Spanish-based game but nevertheless it is so successful that has entered our list of recommended games. That means so many users play it that the ratings are very high. 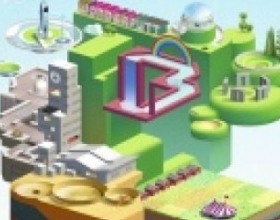 "WonderPutt" is a simple mini golf game, only with FANTASTIC 3D graphics and environment. You will find such things as cows, toads, ski slopes, torpedoes, aliens and many other things on your mission to push a little ball around eighteen holes in a pursuit of the lowest score. Use mouse to aim, set power and putt the ball. While we are developing new Spanish games you may take a chance and look through other categories. Be sure there id=s always something worth playing on www.13games.ru.